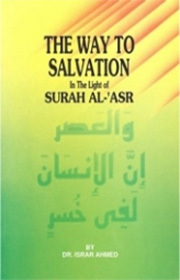 SURAH AL-’ASR, a very early Makkan surah is one of the shortest surahs of the Quran. The words used in this surah are also commonly used in Urdu and are familiar to those who have a fair knowledge of this language. This is why a sketchy meaning of the surah is grasped without much difficulty by every Urdu-knowing individual. But studied and pondered over at a deeper level, this Surah opens up a treasure house of knowledge and wisdom. As a matter of fact, there is a striking analogy between this surah and Surah Al-Ikhlas. Surah Al-’Asr sums up in a few concise words the way and practical guidance that leads to eternal success and salvation just as Surah Al-Ikhlas delineates in a few words the nature and unity of Godhood in Islam. Though very short and compact, both of these surahs are extremely rich in meaning relating to their respective themes. On this ground Maulana Hamid-ud-Din Farahi has categorized Surah Al-’Asr as an aphorism of great wisdom, whereas lmam Al-Sha’feii maintained that a deep and thoughtful study of this surah alone provides adequate guidance for attaining one’s salvation. This surah is composed of three verses. The second verse is of central importance in meaning and significance. This verse expresses the painful and tragic state of man generally, a state of loss and deprivation. The evidence for this is presented in the first verse, in the form of an oath or adjuration. The third verse of the surah carves out an exception from the general condition of man laid down in the second verse. In this way, this surah is clearly divided into two parts. Its first part ‘By fleeting time, verily man is doomed (or destined) to loss and ruin’—consists of a statement and its proof and as such is of immense philosophical significance, whereas the second part of the surah —‘Save those who believe, and do righteous deeds, and unite for the sake of truth and steadfastness’—is of utmost practical importance, giving the essential requirements and conditions of a successful life, a precise but nevertheless complete and comprehensive elucidation of the ‘right path’.